Friends! Romans! Tri-State Countrymen! 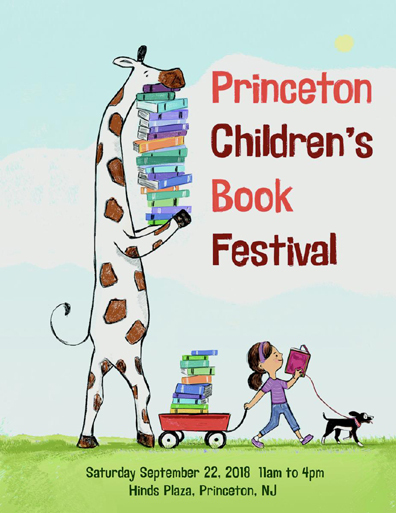 Travel henceforth to Princeton this weekend for the Princeton Public Library‘s legendary Children’s Book Festival! Every year, scores of talented authors and illustrators gather under the library’s big white tents in Hinds Plaza, meeting fans and signing books. 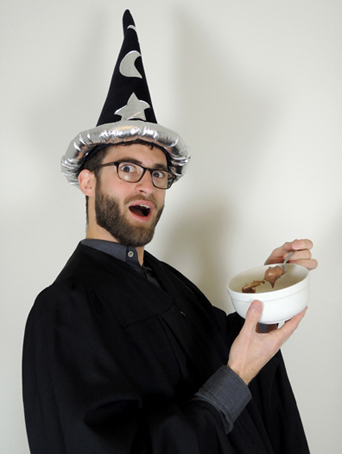 My personal highlights over the past 12 years of the book festival…receiving writing advice from Rebecca Stead, seeing my buddy Galen Longstreth sharing her adorable book, Yes, Let’s, and having a breakfast chat with Pseudonymous Bosch before the event. My library was there in 2010 as well, doing a “Books Done Wrong” activity! 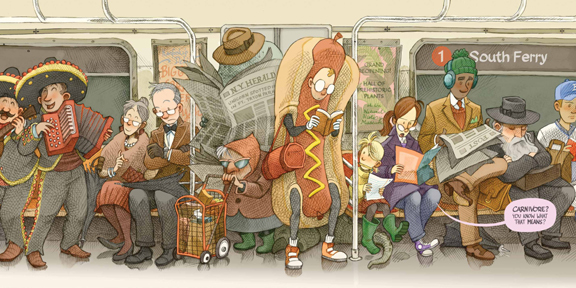 The public library always invites terrific authors and illustrators. Here’s the 2018 line-up if you’d like to see it. But if we may be so bold as to make a few blog connections to this year’s festival attendees? Tracey Baptiste: The author of The Jumbies now has a sequel out called, Rise of the Jumbies. I interviewed Tracey in 2016. Her books are suspenseful, spooky, and straight up awesome. 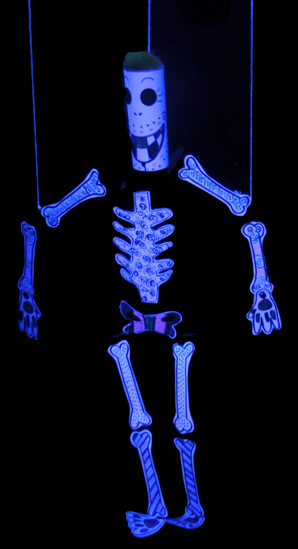 Margery Cuyler: Margery’s Skeleton for Dinner is totally hilarious, and we hope we did her book justice with our dancing, glowing skeleton marionette project. Ame Dyckman: Ame has had three featured projects on our blog! 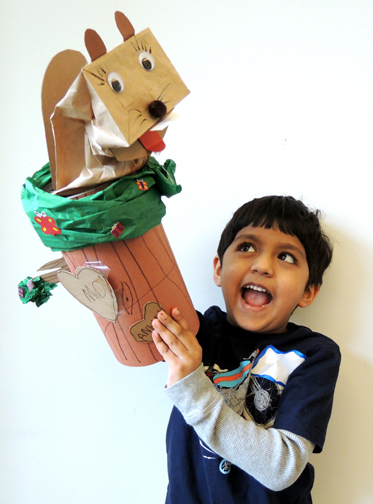 A robot marionette for Boy + Bot, a bouncing baby wolf for Wolfie the Bunny, and a raucous tea party game for Tea Party Rules. 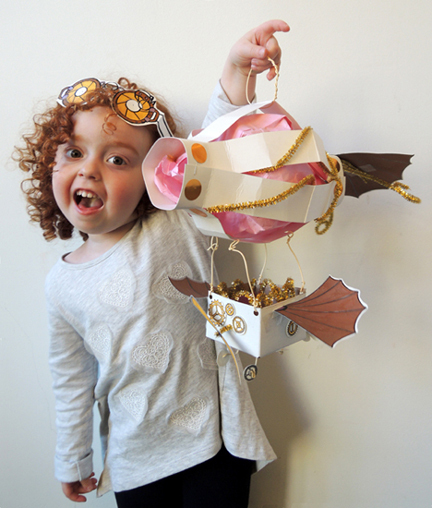 She’s inspired so many projects…probably because her books are so fun and amazing. Steve Light: Master wielder of all things fountain pen, Steve caught our eye with Zephyr Takes Flight, and we just HAD to do a steampunk airship project. We had to! Zachariah OHora: Zachariah’s distinctive illustrative style has graced blog twice in books, once for Wolfie the Bunny and again for The Teacher’s Pet. We’re dying to do a project for The NOT So Quiet Library. Lauren Magaziner: Lauren’s book, Pilfer Academy, was a featured book at To Be Continued in 2016. 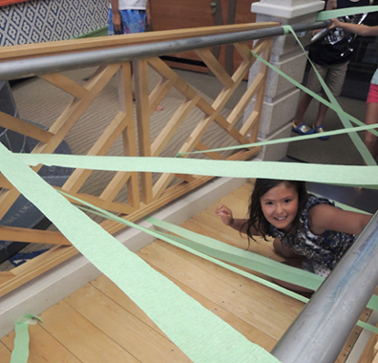 Our book-related activities involved lots of sneaking around, stealing things, and a green crepe paper streamer laser maze. Oh yeah. Wendy Mass: I interviewed Wendy in 2009 and WOW has she been busy, including being on the New York Times Bestseller list for The Candymakers! She recently released Bob, a book she co-wrote with Newbery Medal winner Rebecca Stead. Christopher Silas Neal: Christopher’s gorgeous, minimalistic, vibrant illustrations in Over and Under the Snow inspired a winter hibernation snow-scape project that was a huge hit at story time. Anica Mrose Rissi: I just posted a hamster-rific blog project for her book, The Teacher’s Pet, along with an author interview. So now you have to go to the festival meet Nica and see all her other fantastic books! Sean Rubin: I did a blog feature on Sean’s debut graphic novel Bolivar in 2017. Bolivar is an astounding work of art and really must been seen in person. Now’s your chance! Daniel Salmieri: Daniel has written and illustrated many books, but we loved his work on Meet The Dullards, and fashioned our boring-not-boring blog project on his playful artistry. Liz Garton Scanlon: Liz’s book In the Canyon is full of playful, vivid rhymes. 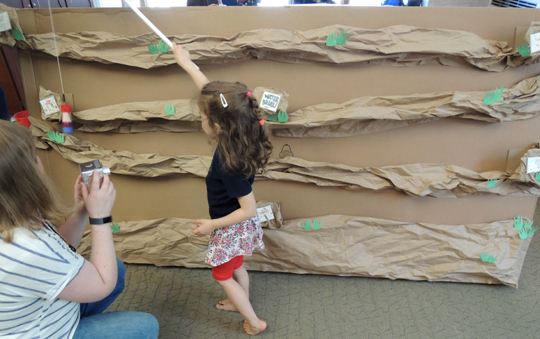 We tried to capture some of the wonder she evokes with our own enormous cardboard canyon. Rebecca Stead: How often do you get to meet a Newbery winner? I interviewed Rebecca about When You Reach Me in 2011 and she has continued to write amazing, thoughtful, and deeply meaningful books. David Ezra Stein: ‘Ol Mama Squirrel? Best. Book. Ever. I couldn’t stop laughing when I read it aloud during story time! 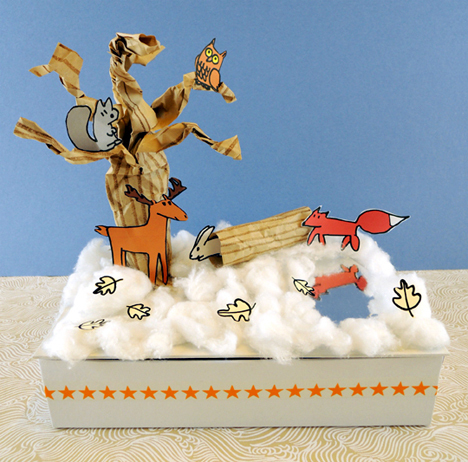 And weirdly, the squirrel tree puppet project went viral in China. Wow. Audrey Vernick: Buffaloes and drum sets. Need I say more? OK, how about winning a giant pet whale? Audrey’s hilarious books such as Teach Your Buffalo to Play Drums and I Won a What? inspire us. 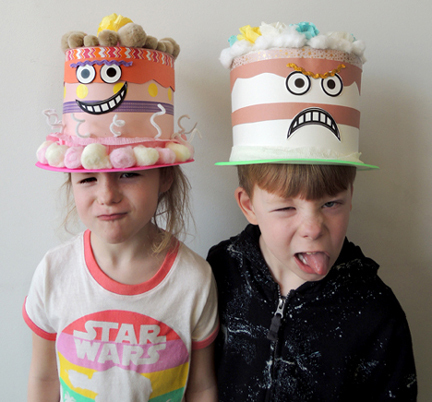 Rowboat Watkins: We made cake hats with attitudes for Rowboat’s fantastic Rude Cakes. 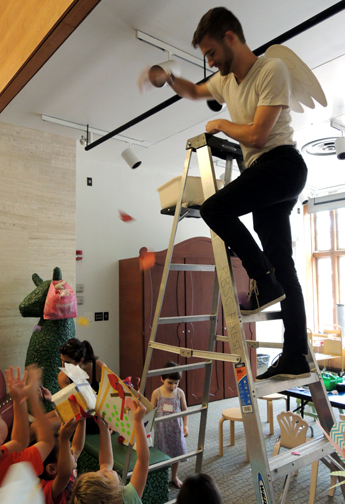 But much to our delight, he popped up unexpectedly in this post about Books of Wonder in NYC. The Children’s Book Festival is Saturday, September 22m from 11am to 4pm in Hinds Plaza of the Princeton Public Library, rain or shine. Books are available for purchase at the event through jaZams, our incredible, local, independent, family-owed toy store. We hope to see you there! It’s August! It’s Pop‘s fifth birthday! That’s right…5 years and 422 posts strong we be. 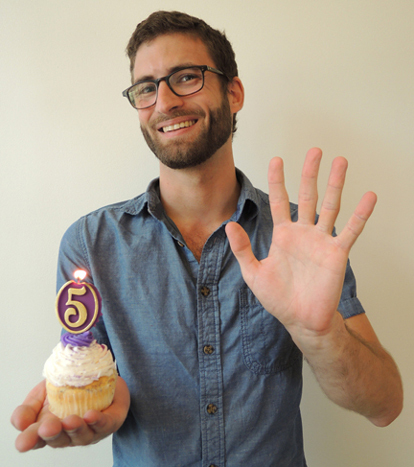 Five years is also how long Ian has worked at our library, but ladies and gentleman, it is a bittersweet announcement I’m making today. 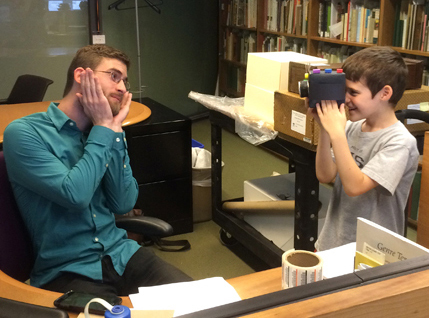 Ian, our Curatorial Assistant, is moving on. But being Ian, he is moving along in the most awesome, stylin’ way possible. 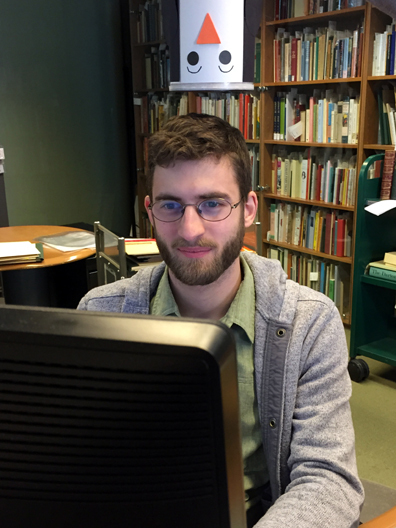 He completed his library degree at Rutgers AND is a newly minted Fulbright Student (he was also awarded a scholarship to Rare Books school in London this summer!). In short, Ian is shining, and we are so very proud of him. 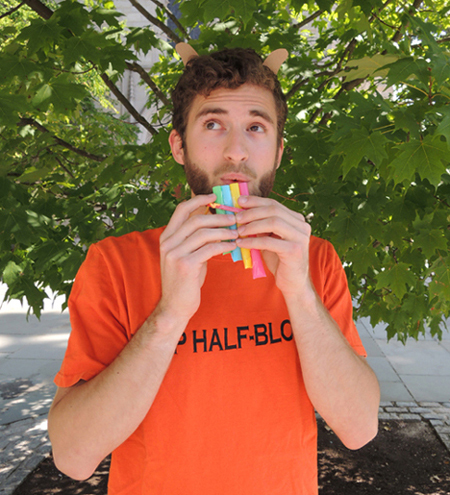 So today’s post is a retrospective of all the things we convinced this intellectual powerhouse to do for the blog. But if you’re just here to see him smash birthday cupcake in my face, skip to the bottom of the post. Where are you off to, Ian? I’m off to Baku, Azerbaijan. For the other geography nerds out there: Azerbaijan is a small country on the eastern side of the Caucasus between Iran and Russia, and Baku is the country’s bustling capital on the west bank of the Caspian Sea. I chose to pursue my Fulbright in Azerbaijan because I am fascinated by the complexities of the region. Azerbaijan is a land of mixing and clashing cultures, a border land of influences and diversity since antiquity, positioned at a crossroads of migration, colonization, and cultural exchange. I wanted to be in a modern city, but one with an ancient and medieval past. I wanted to be some place less familiar and rewardingly challenging. 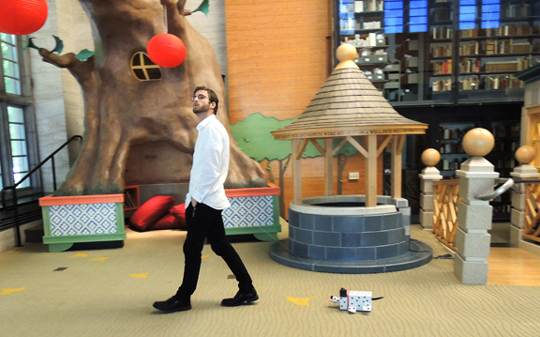 What will you miss about our library? It has been a true privilege and a joy to work with the rare books and other materials here at Cotsen. Every day is filled with new discoveries, new learning, color, art, and mystery. I forget sometimes how lucky I am to get to experience what “old books” can show us and how the chance to do what I do for a living is rare indeed. I’m not sure I’ll ever work in an “office” this fun again. And I will miss my colleagues at Cotsen most of all because one will always miss their friends when they move away. 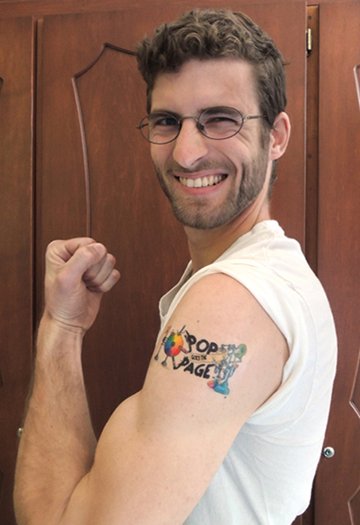 What was your favorite thing you did for Pop Goes the Page? Definitely the time I got crammed into a robot costume. 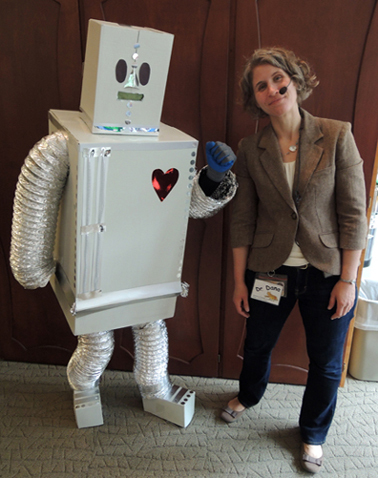 Not only did I get to dance the robot dressed as a robot, I was also really happy to be part of a story time activity featuring a really sweet book. The kids liked it too, I got a lot of hugs that day! Who is cooler, Dr. Dana or Katie? Dang, honestly I think they’re both nerds! Good thing for them that at the library, nerds are cool! A birthday is nothing without sugared toppings, so I grabbed a couple cupcakes for Ian’s final blog photo shoot. Except that meant there were extra cupcakes sitting around. To be smashed into my face. Before final consumption. Ian, we are really going to miss you. Best of luck in your world travels, academic pursuits, hopes, and dreams! Waves of love and joy from us, your friends, to you – Ian the Indomitable. I’m about to embark on a work trip, so short post today! A few weeks ago, I found myself in Asbury Park, New Jersey at the Silverball Museum. 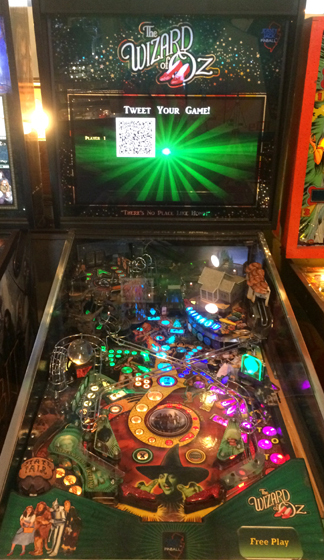 Basically, you pay the museum a flat fee and then play loads of their vintage pinball and arcade games. 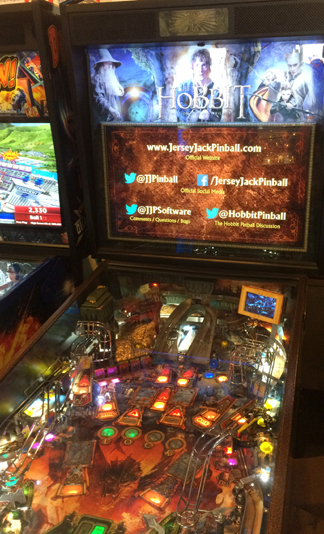 Imagine my delight when I discovered not one but TWO literary pinball machines! Ladies and gentleman, may I present The Hobbit? Alas, I tanked playing The Hobbit and got completely schooled on Frogger. But I rallied for Tetris, Pole Position, and 1992-era Skee Ball. 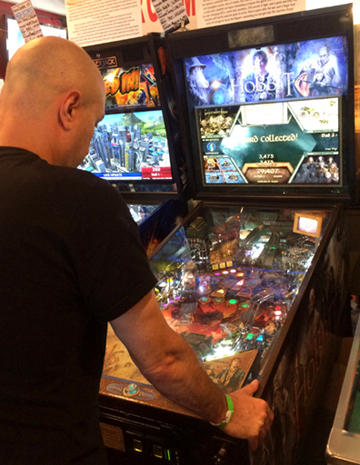 The Silverball Museum is definitely worth a stop for fun, games, classic concessions, and a chance to multiball on the Yellow Brick Road!